Selichot recordings from "Ha-project shel Revivo"
A highlight of the 2013 Boston Jewish Music Festival was a concert which featured violin virtuoso Itzhak Perlman and Cantor Yitzchak Meir Helfgot, backed by the Klezmer Conservatory Band and members of Boston Musica Viva. One of the most rewarding productions I have seen this year was the live music score written to accompany an early silent film, The Yellow Star. Written by violin maestro (maestra?) Alicia Svigals, and performed by her along with the equally amazing pianist, Marilyn Lerner, was incredible. The movie? Okay, it is easy to see how it got lost between the cracks. But the combination of violin, piano, and human voice that accompany the movie change the experience from viewing a static cultural document with curious history (essentially, an anti-Russian propoganda film created by Germans during WWI), to something far more alive and exciting—a iece that one hopes will remain in the active performance repertoire. The piece is especially poignant as the National Foundation for Jewish Culture seems to have gotten out of the Jewish culture business and is instead focused on Israeli culture (not remotely the same thing, despite the obvious intersections). Feh. Community Klezmer Initiative in Philly now 501(c)(3)! It's official, the grand Philadelphia outreach klezmer jam/open mic/cabaret/community dance project is finally, officially, a non-profit. For now, that means that they need people to show up and participate—easy to do. Sessions occur on the 1st Sunday of each month (although this month's was deferred due to Labor Day). Celebrate first Sundays with your family, friends and neighbors. You can find out more at the group's home page which also contains a link to download sheet music (and get directions to the Main Line Reform Temple). You are also encouraged to "like" them on Facebook. New Veretski Pass project, "Lillith the Night Demon"
Lilith is the "alternate" Jewish story of creation, its earliest appearance being from the Babylonian Talmud, with references from Mesopotamia and the Dead Sea Scrolls. The work is to be created in collaboration with the San Francisco Choral Artists (SFCA). The composition uses the structural elements of the Kamea, (Heb. "amulet"), ritual objects wherein charms against Lilith abound. The work highlights some of the lesser-known facets of Jewish mysticism and superstition and integrates them into a new composition that uses traditional gestures of East European Jewish music as well as modern compositional and improvisatory elements. The piece is currently scheduled to premiere in May 2014; possibly being previewed in some form at the Jewish Music Festival in Berkeley, March 2014. Stay tuned! Have I mentioned this yet? So rare that one of Boston's jazz clubs notices klezmer, and here are the two most-frequently-performing local bands in one go. I'm very excited. It's on our calendar. On yours, yet? "I would like to let you know about a big event that we are putting on next month. Ezekiel's Wheels is releasing their new album, Transported, and Klezwoods will be opening the program up for them @ The Regattabar on September 24th. They are making it the 1st Annual Regattabar Klezmer Music Festival! We are doing a big push for this show as it's a particularly special event. This could be a good opportunity to bring in bigger acts in the future as well if this festival goes over well in its first year and would be huge for the Klezmer music community here in Boston. Here are all the exact details. So, last week I started out talking about some edge-pushing music from Israel. This week that brings a bundle of nostalgia from Hatikvah Music in LA, just in time for the holidays. By the late 1950s, American Jews found themselves at home in the US as perhaps in no country since Spain almost 1000 years earlier. American pop musicians were singing Jewish pop and sacred music and creating hits. This collection documents a period, mostly from the late 1950s into the early 1960s where Jewish music was part of the pop gestalt as perhaps never before or since. Eartha Kitt's version of "Rumania, Rumania" is worth the CD all on its own, but other stars featured include Johnny Mathis, Andy Williams, Jackie Wilson (yes, that's really "Hava Nagila! "), and more. To make the CD worth ordering in this season, it includes opera star, Cantor Jan Peerce's "Kol Nidre." Jewish Soul. Tell Simon that you heard about it here on the KlezmerShack. The revelation of this set of reissues, however, is the woman that Hatikvah Music owner Simon Rutberg says "got me into Jewish music." I can hear where he is coming from. Sloan has an amazing voice, and this collection of Moishe Oisher classics still sounds fresh and exciting. I got hooked on the opening "Haggada in Song", fell into shul-going spirits with "Sheyiboney Beys Hamikdash," and perfectly captures the cross-over excitement of "Hassidic in America." Mimi Sloan / sings Moishe Oysher classics, another excellent re-issue from Hatikvah Music. Even less familiar to me is this collection, Leo Fuld /sings his greatest Yiddish hits. Fuld was a Dutch singer who made a splash as a pop singer before WWII, and gradually incorporated more Yiddish and Hebrew into his act. After losing his family in the Holocaust, he stopped singing for several years while earning a reputation as a writer. He is perhaps best known for his translation of "Vi ahin zol ikh geyn" ("Where can I Go? "—you can hear the Johnny Mathis version of this hit on Jewish Soul, above.) His music remains incredibly popular in Europe and Israel. Time to break through again in the US? Before Tevye, Theo Bikel was leading the Yiddish wing of the great folk scare to great effect. In this first Elekra recording, he writes, "This is the first alum of Yiddish folklore I have recorded. I do not intend it to be my last." Theodore Bikel / sings Jewish folk songs captures the voice of an already vigorous, young Bikel, and many songs that we know think of as "classics," from "Kum aher du filozof," a classic "Homentashn," and a straight-forward "Lomir zich iberbeten" that eschews some of the art-song heaviness of later recordings by other artists Enjoy. Bikel returns here for a second outing of Jewish folk favorites with arrangements by Fred Hellerman (one of the "Weavers"). Theodore Bikel / sings more Jewish folk songs may have strings surrounding the folk music, but you can still hear the "sing-along" on songs such as "Lomir alle zingen," or the personal connection between you and the singer on numbers such as "Unter a kleyn beymele" or "Papir iz doch veis." This final release from the Bikel '60s Elektra canon, Theodore Bikel / Sings Yiddish theatre and folk songs features a song familiar to all of us who fell in love with the recent Coen Brothers movie, A Serious Man, "Dem Milner's Treren." I'm also partial to his take on the always-timely "Dire Gelt." The High Holidays being upon us, I'd like to take a moment to acknowledge a fascinating collection of "Kol Nidre" recordings featuring composers/arrangers as diverse as Max Bruch and John Zorn, performed by a variety of French ensembles, Kol Nidre / Eight Visions. According to the liner notes (wonderfully detailed, in both French and English) these 8 recordings date from a concert organized by the French Liberal Jewish Union and the French Center for Jewish Music held on Nov 18 and 22, 2009, in the Synagogue of the rue Copernic, recording by radio station "France Musique." For lovers of 20th century Jewish nusakh, lovers of classical music, and anyone caught up in this season, this is a very special recording. One of the most treasured groups to find me in recent years is a small band from the former Yugoslavia known as "Shira U'tfila." They perform traditional Sephardic songs, liturgical, life-cycle, and just plain folkish. 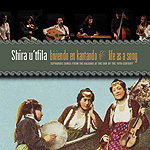 Their most recent recording, Shira U'tfila / Life as a song (2010) focuses on the first available recordings of Sephardic repertoire from the likes of Haim Effendi and Victoria Hazan. The songs range from love songs to religious piyyutim, and the sound will be familiar to all lovers of Greek, Turkish, and similar music descended from the cultures of the Ottoman Empire. Better yet, the second disc in this two-disc set contains the original recordings against which the group's efforts may be judged! Like earlier recordings, this is not only extraordinary work, but is produced with love and wonderful notes. The music is also available as mp3 via iTunes and Amazon.com. An earlier CD, Shira U'tfila / Sephardic Songs from the Balkans is available from the polish vendor, Orangeworld. This recording features the band playing with a variety of male and female soloists, and again, is produced in a beautiful package with copious notes. I would consider both "essential" and incredible pleasure.